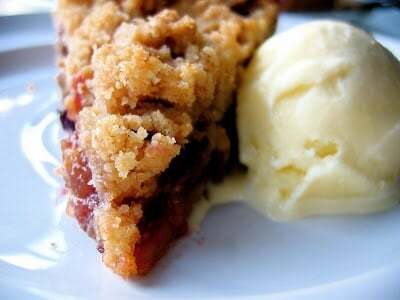 My absolute favorite type of dessert is one made with ripe, seasonal fruit, hot from the oven, with a buttery flakey crust or topping and a big scoop of melting ice cream. For this reason, nothing beats a fruit crisp for ease, speed and sweet tooth satisfaction. 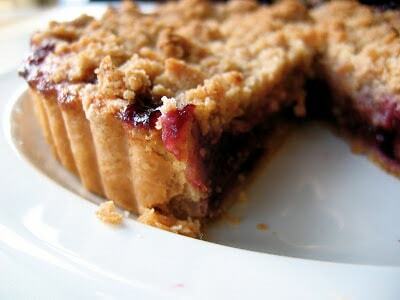 Nothing, except maybe that same, gooey, buttery fruit crisp contained within a tidy, crispy tart shell. I adapted this recipe from one I clipped from Gourmet a couple years ago. While it may look complicated and time consuming, it is delightfully simple to make and comes together quickly and efficiently; just the sort of recipe I like. You make the beginnings of a pie dough, then set aside a portion of the butter-flour mixture to which you add sugar for the crumble topping. Roll out the dough, toss the fruit with cornstarch and sugar, lay it in the unbaked shell, then crumble the topping over. Stick it in the oven and forget about it for a while (I recommend rewarding your hard labor with a glass of wine), and you’ve got yourself an impressive and swoon-worthy dessert. 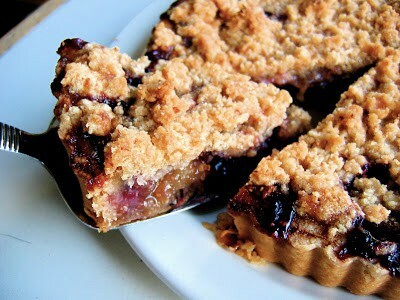 A simple fruit tart with a crumble topping. Servings: 8 servings (makes a 8 or 9 inch tart). Combine the flour and salt in a medium bowl. Add the butter and work with your fingers until some pea-sized chunks remain. Measure out 1 1/2 cups of the mixture into another medium bowl and set aside. To the original bowl, drizzle in the ice water slowly, tossing with your fingers or a rubber spatula, until the dough just starts to come together when you give it a squeeze. Gather into a ball, flatten into a disc, slip into a plastic bag and chill for 1 hour, until firm. Preheat the oven to 375º. Position an oven rack on the lowest position. If you have a baking stone, place in on the rack. Roll the dough out on a lightly floured surface into a 10" round, a scant 1/4" thick. Ease it into an 8 or 9" tart pan with a removable bottom, trim the edges to a 1" overhang and fold over, pressing the sides even. Freeze 20 minutes. Toss the fruit in a bowl with the sugar, cornstarch, juice and salt to combine thoroughly. Turn into the unbaked tart shell and spread even; it may mound slightly in the center. Crumble the topping evenly over the fruit. Place on a baking sheet lined with parchment (for easy cleanup), and place in the oven, on the stone. Bake about 1 hour, rotating once, until the fruit is bubbling thickly, and the crisp topping and tart shell are nicely browned. Remove from the oven. Let cool at least 20 minutes. Remove sides and slide the tart onto a cutting board or serving platter. Slice and serve with ice cream, whipped cream or creme fraiche. 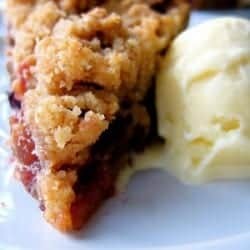 My favorite thing about this recipe is that the fruit and topping go into an un-baked crust - yay! I made this in an 8" tart pan, but I think a 9" pan would work fine, as well. Add 1/3 cup quick (baby) oats and 1/2-3/4 teaspoon ground cardamom to the crumble topping. For the fruit, use 1 1/2 cups rhubarb cut into 1/2" dice, 1 1/2 cups blueberries, and 1 cup raspberries. Increase the sugar in the filling to 1/3 cup. Serve the tart with vanilla ice cream. 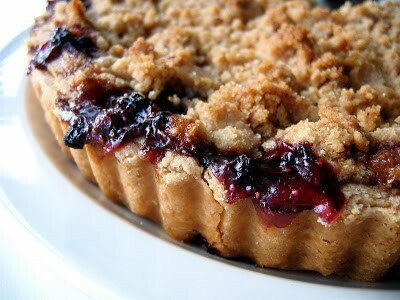 Adapted from GourmetMy favorite thing about this recipe is that the fruit and topping go into an un-baked crust – yay! I made this in an 8″ tart pan, but I think a 9″ pan would work fine, as well. 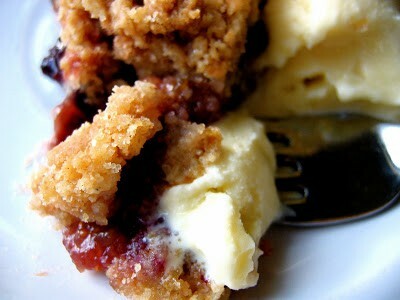 See below for a Rhubarb Berry variation with Cardamom Oat Crumble. Combine the flour and salt in a medium bowl. Add the butter and work with your fingers until some pea-sized chunks remain. Measure out 1 1/2 cups of the mixture into another medium bowl and set aside. To the original bowl, drizzle in the ice water slowly, tossing with your fingers or a rubber spatula, until the dough just starts to come together when you give it a squeeze. Gather into a ball, flatten into a disc, slip into a plastic bag and chill for 1 hour, until firm. Roll the dough out on a lightly floured surface into a 10″ round, a scant 1/4″ thick. Ease it into an 8 or 9″ tart pan with a removable bottom, trim the edges to a 1″ overhang and fold over, pressing the sides even. Freeze 20 minutes. Toss the fruit in a bowl with the sugar, cornstarch, juice and salt to combine thoroughly. Turn into the unbaked tart shell and spread even; it may mound slightly in the center. Crumble the topping evenly over the fruit. Place on a baking sheet lined with parchment (for easy cleanup), and place in the oven, on the stone.Bake about 1 hour, rotating once, until the fruit is bubbling thickly, and the crisp topping and tart shell are nicely browned. Remove from the oven. Let cool at least 20 minutes. Remove sides and slide the tart onto a cutting board or serving platter. Slice and serve with ice cream, whipped cream or creme fraiche. Add 1/3 cup quick (baby) oats and 1/2-3/4 teaspoon ground cardamom to the crumble topping. For the fruit, use 1 1/2 cups rhubarb cut into 1/2″ dice, 1 1/2 cups blueberries, and 1 cup raspberries. Increase the sugar in the filling to 1/3 cup. Serve the tart with vanilla ice cream. I find a strawberry, sliced lengthwise, to be much more suggestive than the fresh fig about which folks often waggle their eyebrows. But suggestive or no, fresh figs are pretty much my favorite fruit in the world, and I am blessed to have incredibly generous friends as Michael and Sara DeWeil with an extremely prolific fig tree in their backyard. I adapted this tart from a recipe in Deborah Madison’s gorgeous book Local Flavors. I picked up my copy five years ago at the Bay Tree Bookstore at UCSC, and it has become my all around favorite cookbook for its beautiful photography, heartwarming prose, and kickass recipes, both sweet and savory. 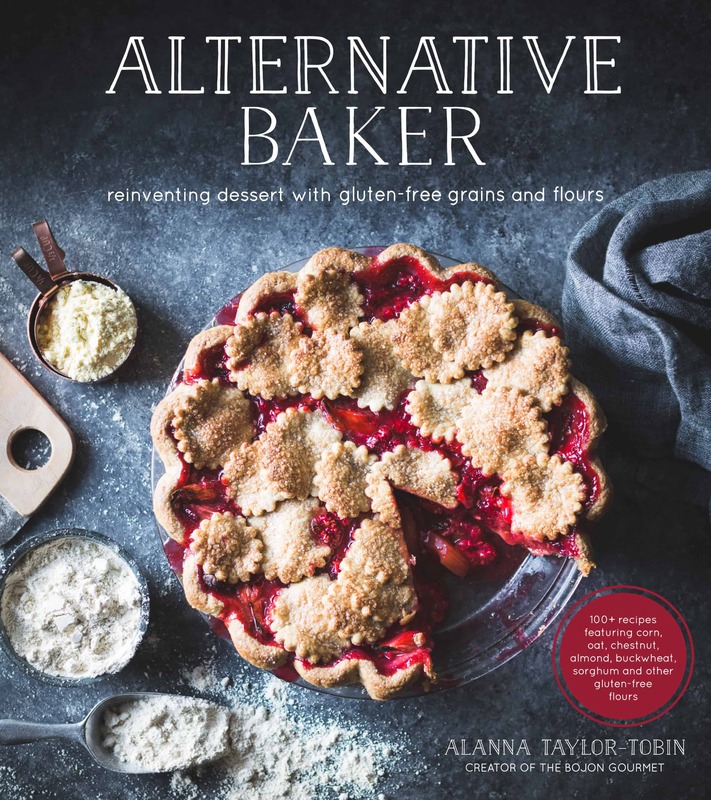 I love this book equally to read in the bath or before bed, or to take on a road trip, or to get inspiration for a weeknight’s dinner. Anyway, I changed up this recipe a bit because of the egg yolks. Being the custard freak that I am, I always seem to end up with jars and jars of egg whites in the fridge, which becomes a worse offense when they are the gorgeous whites of the happy chickens from Eatwell Farm. If I were to make meringues from all those whites, I would have enough to fill a house. And I hate meringues. So I altered this tart recipe so that instead of using two yolks in the crust and one in the custard, I just used half an egg in each. I also used honey in the custard instead of sugar, and added a sprinkling of coarse sugar on top which caramelized in the heat of the oven. Now how ’bout this fig leaf ice cream? It certainly sounds bizarre. I got the idea from Kate Zuckerman’s book, The Sweet Life: Desserts from Chanterelle, and didn’t have much faith as I made the custard base. (Yes, I know, four more egg whites sittin’ in the fridge, but philly-style ice creams and cornstarch-based gelati just aren’t the same, I’m sorry.) But when I tasted the churned ice cream, it hit me: the distinctive flavor of figs, without the seeds and slimy texture. Incredible. So if you’ve got a fig tree, or a friend with one, give this ice cream a try to serve with any fig dessert, or just serve with plain old fresh figs, if they’re not too suggestive for you. 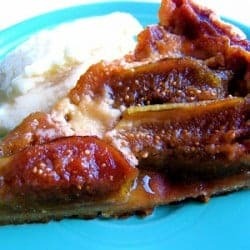 A delicious fruit tart made with fresh figs! Servings: 8 servings (makes 1 8 inch tart). Scald the milk with the leaves in a medium saucepan. Cover and let steep 20 minutes. Have the cream in a bowl or large container with a fine-mesh sieve set over it. Whisk together the yolks, sugar and salt in a medium bowl to combine. Re-scald the milk, and temper into the yolk mixture. Return the mixture to the pan and cook, stirring constantly with a rubber spatula, until it thickens slightly and just begins to stick to the bottom of the pan, 170º. Immediately pour through the sieve and into the cream. Place in the fridge until thoroughly chilled, at least 4 hours, or up to two days. Fit into an 8" round tart pan with a removable bottom, make the edges pretty. You should know how to do that by now. Chill until firm, about 1 hour. Preheat the oven to 375º and position a rack on the lowest position. Line the chilled dough with parchment paper and pie weights, place the tart pan on a baking sheet, and bake until the bottom looks dry when you lift up the parchment, about 15 minutes. Remove the weights, and bake until the bottom is slightly browned, 5 or 10 minutes more. Remove while you prepare the filling. Patch any holes with leftover dough scraps. Quarter larger figs, or halve smaller ones. Lay figs in the tart shell in concentric circles. Whisk together the remaining filling ingredients and pour around, not over, the figs. Sprinkle the sugar over the top. Return to the oven, and bake until the juices from the figs are bubbling thickly and the custard is puffed and golden in places. The baking time will vary depending on how juicy your figs are - mine took around 45 minutes, but check it after 20 minutes. Let cool slightly. This tart is best served warm, with a quenelle of ice cream alongside, or a drizzle of creme fraiche. Scald the milk with the leaves in a medium saucepan. Cover and let steep 20 minutes. Have the cream in a bowl or large container with a fine-mesh sieve set over it. Whisk together the yolks, sugar and salt in a medium bowl to combine. Re-scald the milk, and temper into the yolk mixture. Return the mixture to the pan and cook, stirring constantly with a rubber spatula, until it thickens slightly and just begins to stick to the bottom of the pan, 170º. Immediately pour through the sieve and into the cream. Place in the fridge until thoroughly chilled, at least 4 hours, or up to two days. Churn in an ice cream maker. Place the butter in the bowl of an electric mixer fitted with the paddle attachment, and sift in the powdered sugar. Beat on medium speed until light and fluffy, 3-5 minutes. Add the egg slowly, beating to combine, then the salt and flour, mixing on low until just combined. Scrape down the sides of the bowl and the paddle, and make sure the dough is homogenous. Scrape out onto a lightly floured surface and gently roll out into an even 10″ round. (If the dough is too soft and sticky to work with, refrigerate until firm.) Fit into an 8″ round tart pan with a removable bottom, make the edges pretty. You should know how to do that by now. Chill until firm, about 1 hour. Preheat the oven to 375º and position a rack on the lowest position. Line the chilled dough with parchment paper and pie weights, place the tart pan on a baking sheet, and bake until the bottom looks dry when you lift up the parchment, about 15 minutes. Remove the weights, and bake until the bottom is slightly browned, 5 or 10 minutes more. Remove while you prepare the filling. Patch any holes with leftover dough scraps. Quarter larger figs, or halve smaller ones. 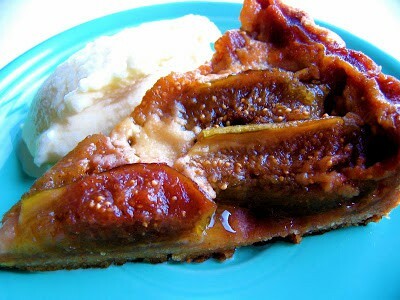 Lay figs in the tart shell in concentric circles. Whisk together the remaining filling ingredients and pour around, not over, the figs. Sprinkle the sugar over the top. Return to the oven, and bake until the juices from the figs are bubbling thickly and the custard is puffed and golden in places. The baking time will vary depending on how juicy your figs are – mine took around 45 minutes, but check it after 20 minutes. Let cool slightly. This tart is best served warm, with a quenelle of ice cream alongside, or a drizzle of creme fraiche. Certainly NorCal boasts a plethora of phenomenal bakeries. But while I adore Acme’s Levain, Tartine’s walnut loaf, and Cafe Beaujolais’s spelt bread, I’ve yet to find an olive bread that rivals La Brea’s. Luckily, Nancy Silverton reveals her secrets for this bread, and many more, in her book. Whole wheat flour and wheat germ add nutty flavor as well as nutritional value. 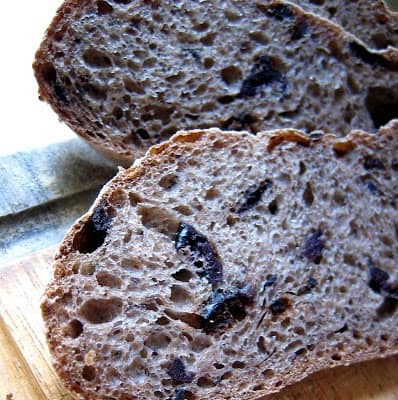 Oil cured olives crumble into the dough, staining it a rich brown and flavoring the dough itself, while an abundance of whole kalamatas, which hold their shape, pack each bite with briny goodness. A judicious amount of fresh thyme adds a subtle nuance of flavor. I’ve adapted Nancy’s recipe to use more starter, tweaking the other ingredients accordingly, and I even go so far as to audaciously double the olives. I love this bread slathered with eggplant caponata and topped with a crumble of goat cheese. The oils in the bread keep it moist longer than you’d expect, up to a week even, which makes it ideal for camping trips. But stick it in the fridge if the weather is very humid, like this past week; mine started sprouting little specks of mold, and had to be relegated to the crouton pile. There are worse fates, though, like living in L.A, for instance. 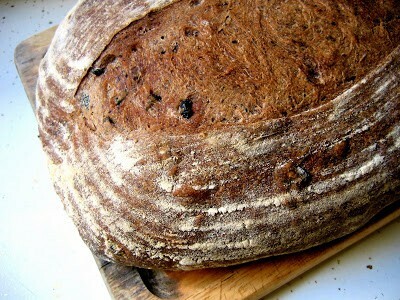 This sourdough is packed full of olives for a delicious bread loaf. Servings: 12 servings (one 2lb loaf). Weigh the starter, water, germ, and both flours into the bowl of a stand mixer fitted with the dough hook. (Add the smaller amount of bread flour.) Knead on medium-low speed (2) for 5 minutes. Cover and let autolyse 20 minutes. Sprinkle on the salt, and knead the dough on medium speed (4) for another 5 minutes. It should be sticky, but not wet, and should pull away from the sides of the bowl as it is kneaded. Add more flour by the tablespoon if necessary. Add the thyme and olives, and knead on medium low (1-2) for another 5 minutes until thoroughly combined. Turn the dough out onto a lightly floured surface and knead a few minutes by hand until the texture feels right, adding as little flour as possible to keep the dough from sticking to your hands and the surface. The dough should feel smooth, springy and elastic; wet enough to be pliable, but not overly sticky. Gently turn the dough out onto a lightly floured surface, pressing out the air bubbles. Shape into a boule by tucking the edges under itself, then gently rotating the dough on the surface to form a taught outer layer of dough. Here's a quick video of how to shape a boule. To shape into an oval, rock the boule on the counter with your palms until is elongates slightly. If you have a rising basket, sift a light layer of flour onto the inside, and place the boule in it upside-down, pinching the seam shut. (If you don't have a rising basket, place the boule directly on a peel or board dusted with cornmeal or flour.) Place the whole deal in a large plastic bag, such as a trash can liner. Inflate the bag and close it with a twist tie or clip. Let the bread rise a second time until doubled, about 1 1/2 - 2 hours. When the bread is ready to bake, it will hold an indentation of your finger when you press it lightly, rather than springing back. While the bread is rising, about an hour before you're ready to bake, remove all but the bottom rack of your oven. Place a baking stone on the rack (or a heavy duty baking sheet), and place a metal pan that you don't care about sacrificing (it will get rusty) on the floor of the oven. Crank the oven up to 500º. When the bread has doubled, gently turn it out onto a wooden peel dusted with flour or cornmeal. 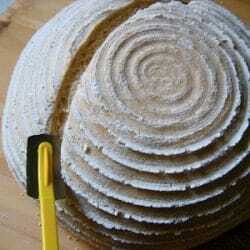 Holding a lame or sharp knife at a 45º angle to the loaf, draw the blade, about 1" deep, across the top of the loaf, beginning and ending 2" from the bottoms of the boule. Fill a 1 cup measure with ice cubes. Quickly slip the boule off the peel and onto the stone, and toss the cubes into the hot pan on the floor of the oven. Bake 20 minutes, then turn the oven down to 450º and bake another 20 minutes or so, until the bread is a deep, burnished golden-brown. An instant read thermometer inserted into the middle should read 210º. Let cool completely on a wire rack, one to two hours, before enjoying. The best way to store this type of bread is in a paper bag at room temperature for a couple days. After that, I put the whole thing, paper bag and all, into a plastic bag and continue to store at room temp. 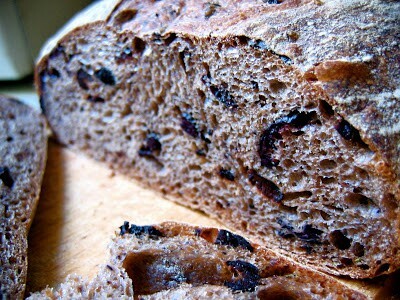 I like to use a stand mixer for this bread as kneading in the olives by hand can be quite messy. See my recipe for a basic boule for more info on starters and instructions for mixing the bread by hand. note: I like to use a stand mixer for this bread as kneading in the olives by hand can be quite messy. See my recipe for a basic boule for more info on starters and instructions for mixing the bread by hand. Weigh the starter, water, germ, and both flours into the bowl of a stand mixer fitted with the dough hook. (Add the smaller amount of bread flour.) Knead on medium-low speed (2) for 5 minutes. Cover and let autolyse 20 minutes. Sprinkle on the salt, and knead the dough on medium speed (4) for another 5 minutes. It should be sticky, but not wet, and should pull away from the sides of the bowl as it is kneaded. Add more flour by the tablespoon if necessary. Add the thyme and olives, and knead on medium low (1-2) for another 5 minutes until thoroughly combined. Turn the dough out onto a lightly floured surface and knead a few minutes by hand until the texture feels right, adding as little flour as possible to keep the dough from sticking to your hands and the surface. The dough should feel smooth, springy and elastic; wet enough to be pliable, but not overly sticky. Gently turn the dough out onto a lightly floured surface, pressing out the air bubbles. Shape into a boule by tucking the edges under itself, then gently rotating the dough on the surface to form a taught outer layer of dough. Here’s a quick video of how to shape a boule. To shape into an oval, rock the boule on the counter with your palms until is elongates slightly. If you have a rising basket, sift a light layer of flour onto the inside, and place the boule in it upside-down, pinching the seam shut. (If you don’t have a rising basket, place the boule directly on a peel or board dusted with cornmeal or flour.) Place the whole deal in a large plastic bag, such as a trash can liner. Inflate the bag and close it with a twist tie or clip. Let the bread rise a second time until doubled, about 1 1/2 – 2 hours. When the bread is ready to bake, it will hold an indentation of your finger when you press it lightly, rather than springing back. While the bread is rising, about an hour before you’re ready to bake, remove all but the bottom rack of your oven. Place a baking stone on the rack (or a heavy duty baking sheet), and place a metal pan that you don’t care about sacrificing (it will get rusty) on the floor of the oven. Crank the oven up to 500º. When the bread has doubled, gently turn it out onto a wooden peel dusted with flour or cornmeal. Holding a lame or sharp knife at a 45º angle to the loaf, draw the blade, about 1″ deep, across the top of the loaf, beginning and ending 2″ from the bottoms of the boule. Fill a 1 cup measure with ice cubes. Quickly slip the boule off the peel and onto the stone, and toss the cubes into the hot pan on the floor of the oven. Bake 20 minutes, then turn the oven down to 450º and bake another 20 minutes or so, until the bread is a deep, burnished golden-brown. An instant read thermometer inserted into the middle should read 210º. It’s a difficult thing to admit, but: Jay doesn’t have a sweet tooth. He didn’t even eat fruit when I first moved in, several years ago, and would turn his nose up at sugary vegetables, such as sweet potatoes and winter squash. While creamy custards and ice cream make me weak in the knees, he can take or leave them, passing them up any day for a bag of salty chips or a plate of greasy french fries. Every so often, though, I catch a gleam of enthusiasm for some childhood classic: pumpkin pie, butterscotch ice cream, tapioca pudding, the old standbys we all enjoy as children. 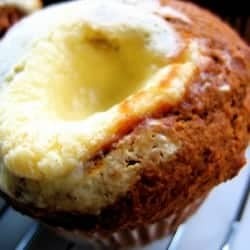 During a muffin phase a few years back, Jay spoke lovingly of pumpkin cheesecake ones he used to get from Rebecca’s Mighty Muffins in Santa Cruz during his college days. I looked around for recipes, but didn’t find anything that seemed quite right. I wanted a sturdy, not-too-sweet muffin made with butter rather than vegetable oil, redolent with the flavors of brown sugar and warming spices. I wanted a smooth, creamy filling with the salty tang of cheesecake, and plenty of it, so that you got some in each bite. Quite pleased with the results, Jay even set aside the chips to devour a few. The first real rain of the season has brought on a desperation to bake with winter squash, so I decided to make these muffins, but I made a few changes from my original recipe, browning the butter, adding freshly grated ginger to the cheesecake mixture and toasted pecans to the muffin batter. They are delicious, but, I don’t know, I kind of prefer the plain-Jane originals. So here’s the original recipe, with the ginger-pecan variation at the end. 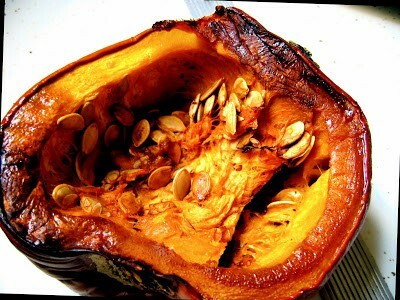 You can use any dense fleshed winter squash for this recipe. I actually don’t favor pumpkins for baking, as they tend to be stringy, watery and bland. This time, I used an incredibly dense-fleshed red kuri squash, but kabochas, hokkaidos and butternuts are other excellent choices. If your squash puree is watery, or if you use canned pumpkin (which is fine), drain it for about 3o minutes in a fine mesh sieve, lined with cheesecloth if necessary. For the squash puree, preheat the oven to 375º. Lightly oil a rimmed baking sheet. Using a large, sharp chef’s knife, cut the squash in half lengthwise. Leaving the seeds in (they are much easier to scrape out once the squash is cooked, and also add flavor and moisture to it during baking) place the squash cut side down on the baking sheet. Roast in the oven until tender when poked with a knife. Let cool. Scrape out the seeds and discard, and scoop the flesh out of the skin. 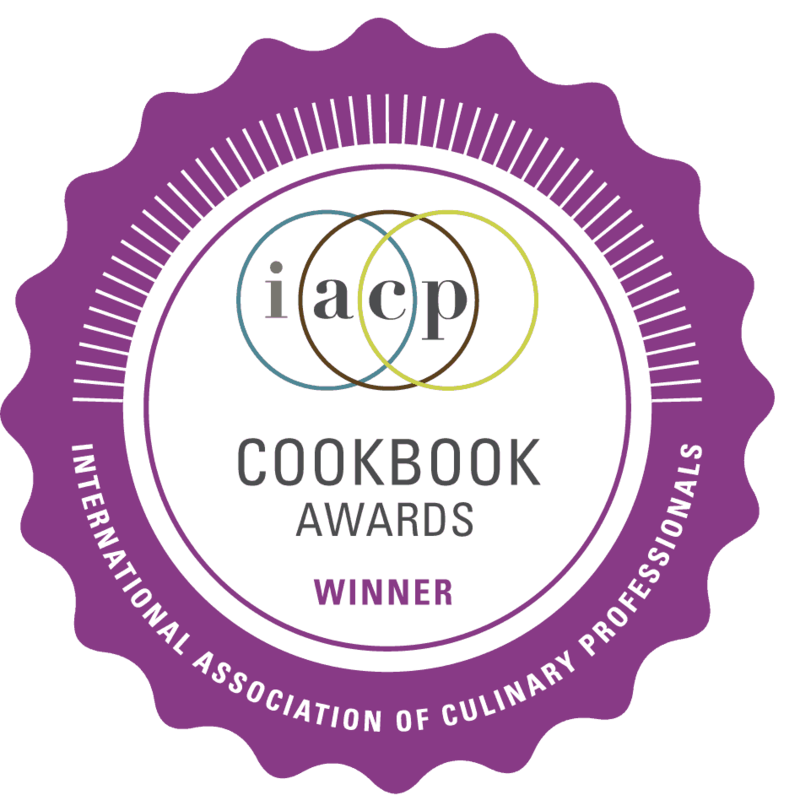 Puree in a food processor or food mill until smooth. These filled muffins are perfect for fall! Beat the cream cheese and sugar together until smooth. Add yolk, sour cream, lemon juice, vanilla and salt to combine throughly. Put in fridge while you get on with the muffins. In a medium bowl, whisk together the melted butter, squash puree, buttermilk, sugar, molasses and eggs to combine. In a large bowl, sift together the dry ingredients. Make a well, and gently fold in the wets until just combined. Divide the batter evenly between the cups. Now comes the fun part, and there are two possible ways to go about it. 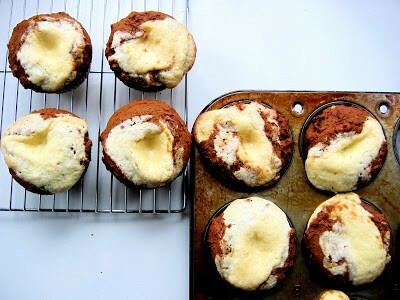 You can either use the back of a spoon to make a small well in the center of each muffin, and spoon the cheesecake filling in. Or use a piping bag fitted with a smallish, plain tip (or a plastic baggie which you will snip the corner off of) and fill with the cream cheese mixture. 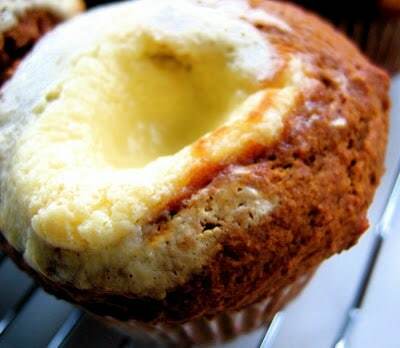 Plunge the tip into the center of the muffin, and gently squeeze out a couple tablespoons. The muffin will puff up. Repeat with the remaining muffins until you have used up all the filling. Bake the muffins on the center rack until puffed and golden, about 30 minutes. Add 1-2 teaspoons finely grated fresh ginger to the cheesecake filling. For the muffins, brown the butter by cooking it over medium heat, swirling occasionally, until it browns, smells nutty and makes you swoon with olfactory pleasure. Let cool to warm. For the spices, substitute the following, omitting the allspice: 1 teaspoon ground ginger, 1/2 teaspoon cinnamon, 1/4 teaspoon freshly grated nutmeg. Toast 3/4 pecans, let cool, and chop coarsely. Gently fold in after combining the wets and dries. Nutritional values are based on one muffin. Preheat the oven to 350º. Line a standard 12-cup muffin pan with muffin liners (does that sound a bit dirty, or is it just me?) In a medium bowl, whisk together the melted butter, squash puree, buttermilk, sugar, molasses and eggs to combine. In a large bowl, sift together the dry ingredients. Make a well, and gently fold in the wets until just combined. Divide the batter evenly between the cups. Add 1-2 teaspoons finely grated fresh ginger to the cheesecake filling. For the muffins, brown the butter by cooking it over medium heat, swirling occasionally, until it browns, smells nutty and makes you swoon with olfactory pleasure. Let cool to warm. One night, like many before me, I got hooked. Molly Wizenberg’s exquisite blog, Orangette, sucked me in with her crack-like writing, spare photography and mouthwatering recipes. Guided there by rave reviews of a chocolate granola recipe, I sifted through her blog for hours, unable to pry my eyes away from her addictive writing style, driven by a lust for chocolate granola. I envisioned something like what you see above, baked granola coated in chocolate, but figured the recipe had to be something really innovative to garner such attention. But when I finally came upon the recipe, at around 4am, I felt a bit disappointed at the image that greeted me: plain granola with chunks of chocolate mixed in. I could have come up with that. So this is my take on what “chocolate granola” ought to be: buttery, toasted oats flavored with brown sugar and vanilla, baked, cooled and coated in bittersweet chocolate. A delectable treat for breakfast, a late afternoon pick-me-up, or sprinkled over coffee ice cream for dessert. A delectable treat for breakfast, a late afternoon pick-me-up, or sprinkled over coffee ice cream for dessert. Preheat the oven to 350º. Line a rimmed baking sheet with parchment paper. 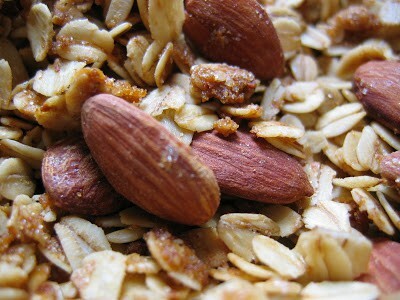 In a medium bowl, stir together the oats and almonds. Melt together the sugar, butter and salt in a saucepan over medium heat. Remove, and stir in vanilla. Toss the butter mixture with the oat mixture to coat thoroughly. Spread evenly on the sheet pan. Bake for ten minutes, then take the granola out and stir it with a metal spatula. Repeat this process two or three times, for a total of 30-40 minutes of baking time, until the oats are golden and toasty. They will still be soft, but will crisp up when they cool. Set the pan on a cooling rack, and let the granola cool completely, about 1 hour. Place the granola in a medium bowl, and reserve the sheet pan and parchment. Place the chocolate in a metal bowl and place the bowl over a pot of barely simmering water. Stir occasionally until the chocolate is completely melted. Remove the bowl from the pot, and let the chocolate cool, stirring frequently, to about 80º. It should feel cool when you touch it to your lip, but still be liquid enough to coat your granola. This tempers the chocolate. (You can skip this step if you're over it, and just melt and fold the chocolate into the granola, but the chocolate may "bloom" and look unattractively streaky.) If the chocolate cools down too much, just place over the pot of barely steaming water and stir constantly until re-melted. Fold the chocolate into the granola to coat thoroughly, and spread on the parchmented sheet pan to cool and set up, about 30 minutes. You could take this recipe in many other directions. Try one of the delicious dark milk chocolates on the market now, such as Scharffenberger. 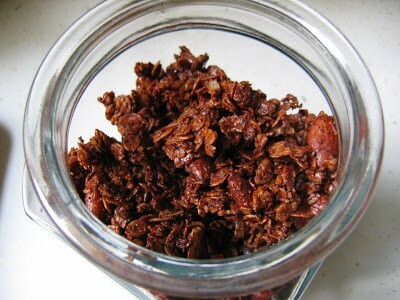 Vary the nuts, or add cocoa nibs, orange zest, espresso powder, shredded coconut, cinnamon or cardamom. 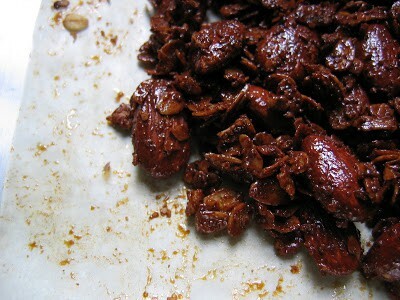 If you add dried fruit or candied ginger, however, do so after baking, when you stir in the chocolate. Preheat the oven to 350º. Line a rimmed baking sheet with parchment paper. In a medium bowl, stir together the oats and almonds. Melt together the sugar, butter and salt in a saucepan over medium heat. Remove, and stir in vanilla. Toss the butter mixture with the oat mixture to coat thoroughly. Spread evenly on the sheet pan. 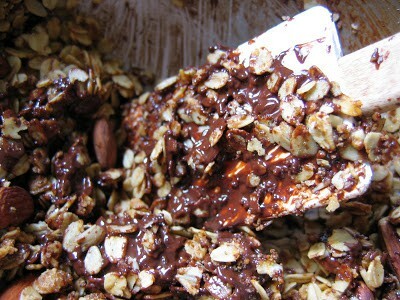 Bake for ten minutes, then take the granola out and stir it with a metal spatula. Repeat this process two or three times, for a total of 30-40 minutes of baking time, until the oats are golden and toasty. They will still be soft, but will crisp up when they cool. Set the pan on a cooling rack, and let the granola cool completely, about 1 hour. Place the granola in a medium bowl, and reserve the sheet pan and parchment. Place the chocolate in a metal bowl and place the bowl over a pot of barely simmering water. Stir occasionally until the chocolate is completely melted. Remove the bowl from the pot, and let the chocolate cool, stirring frequently, to about 80º. It should feel cool when you touch it to your lip, but still be liquid enough to coat your granola. This tempers the chocolate. 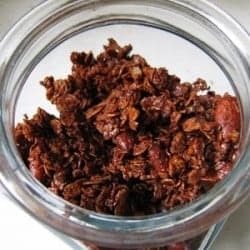 (You can skip this step if you’re over it, and just melt and fold the chocolate into the granola, but the chocolate may “bloom” and look unattractively streaky.) If the chocolate cools down too much, just place over the pot of barely steaming water and stir constantly until re-melted. Fold the chocolate into the granola to coat thoroughly, and spread on the parchmented sheet pan to cool and set up, about 30 minutes. The first sourdough bread I ever baked, four years ago, turned out as hard and dense as a brick. Living in the sourdough capital of the world, I felt like a real loser. I had followed a lengthy recipe, raising my own starter from flour and water, nurturing it for three whole days until it began to bubble and smell tangy. My failure probably had more to do with a weak, newborn starter than anything else, but that was cold comfort. As my starter matured, though, the bread I baked with it came out better and better. Since then, I’ve raised a few different starters, but I’d always end up killing them out of neglect when the summer months came and it was too hot to fathom cranking the oven up to 500º. Then, last spring, I inherited the most active, robust starter I’ve ever had the pleasure of baking with. I don’t know the origins of this starter, and have suspicions that it may have been started with commercial yeast. But that doesn’t matter to me now. I can ignore my starter in the fridge for weeks, then take it out and feed it with nary a pout or obstinate refusal to rise. Instead, it bubbles up beautifully, like a wagging dog greeting you at the door after you’ve been gone all day, leash in snout, eager for a walk. “No need to make pancakes,” it tells me, “I’m ready for the big guns.” This one’s a keeper. Over the years I’ve equipped myself with the proper bread baking materials: a baking stone, a coiled willow rising basket, and a lame for slashing the unbaked loaves, as well as the sourdough bible, Nancy Silverton’s Breads From the La Brea Bakery, which includes, aside from dozens and dozens of sourdough loaves, boules and flatbreads, recipes for sourdough pancakes, doughnuts, onion rings, and even a souffle-like sourdough chocolate cake. I cannot recommend this book highly enough for anyone interested in sourdough, novice and pro alike. Though Nancy has been with me through many a glorious loaf, she also encourages one to strike out on ones own. So I decided to write my own bread recipe. Most sourdough recipes call for a very little bit of starter, half a cup or so per large loaf, which really bugs me, since I always have such a surplus. I decided to try tripling the amount called for in Nancy’s basic white boule recipe, adjusting the quantities of the other ingredients accordingly. It was the best loaf I’ve baked yet; a bit denser than Acme’s Levain, my naturally leavened holy grail, but every bit as chewy and full flavored, with an open crumb and a nicely caramelized crust. Any bread you don’t get to can be made into killer croutons. Around these parts, we cube extra bread and store it in the freezer, then fry it in olive oil in a cast-iron skillet, add a sprinkling of salt, and munch them on salads and soups. A chewy and full flavored bread loaf with an open crumb and a nicely caramelized crust. After 20 minutes, remove the bowl and knead the dough vigorously for about 10 minutes, adding as little flour as possible to prevent the dough from sticking to your hands and the surface, until it feels smooth, springy and elastic. Place the dough in a large, lightly oiled ceramic bowl or a large plastic container at least twice the size of the dough. You can mark the outside of the vessel with a piece of masking tape where the dough will be when it doubles, if you like. Cover the vessel tightly with plastic wrap or the lid, and allow it to rise until doubled, three to four hours. The warmer the spot you choose, the faster it will rise, the ideal temperature being 75-85º. You can also let the dough rise in the fridge or a cool place overnight. Let the dough come to room temperature before shaping it, and be sure that it has doubled in bulk to properly develop the glutens. Gently turn the dough out onto a lightly floured surface, pressing out the air bubbles. Shape into a boule by tucking the edges under itself, then gently rotating the dough on the surface to form a taught outer layer of dough. Here's a quick video of how to shape a boule. If you have a rising basket, sift a light layer of flour onto the inside, and place the boule in it upside-down, pinching the seam shut. (If you don't have a rising basket, place the boule directly on a peel or board dusted with cornmeal or flour.) Place the whole deal in a large plastic bag, such as a trash can liner. Inflate the bag and close it with a twist tie or clip. Let the bread rise a second time until doubled, about 1 1/2 - 2 hours. When the bread is ready to bake, it will hold an indentation of your finger when you press it lightly, rather than springing back.While the bread is rising, about an hour before you're ready to bake, remove all but the bottom rack of your oven. Place a baking stone on the rack (or a heavy duty baking sheet), and place a metal pan that you don't care about sacrificing (it will get rusty) on the floor of the oven. Crank the oven up to 500º. When the bread has doubled, gently turn it out onto a wooden peel dusted with flour or cornmeal. 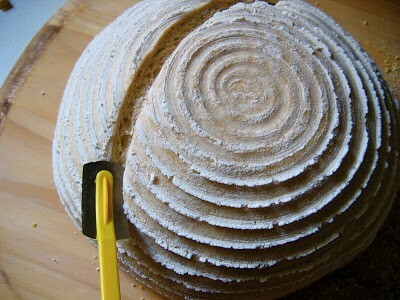 Holding a lame or sharp knife at a 45º angle to the loaf, draw the blade, about 1" deep, across the top of the loaf, beginning and ending 2" from the bottoms of the boule. (Just look at the darn picture, ok?) Fill a 1 cup measure with ice cubes. Quickly slip the boule off the peel and onto the stone, and toss the cubes into the hot pan on the floor of the oven. This will steam the outside of the loaf, allowing it to expand as it bakes. Bake 20 minutes, then turn the oven down to 450º and bake another 20 minutes or so, until the bread is a deep, burnished golden-brown. An instant read thermometer inserted into the middle should read 210º, the temperature at which the dough is set. Let cool completely on a wire rack, one to two hours, before enjoying. At this point, the bread is still "baking" from the residual heat and steam inside the loaf. The best way to store this type of bread is in a paper bag at room temperature for a couple days. After that, I put the whole thing, paper bag and all, into a plastic bag and continue to store at room temp. After a couple of days like that, it there's any left over, we make croutons. In order to raise bread, your starter has to be refreshed, full of bubbles and vigor. If your starter isn't doubling within four or five hours when you feed it, it will not be strong enough to raise bread. "If baking is all about patience, sourdough baking is all about more patience." I read that somewhere. So make sure your starter is active and full of bubbles; if it isn't, don't despair; bake some sourdough crackers and give the starter another feeding or two til it's ready. I keep my starter rather thick and almost gloppy, the consistency of a very thick pancake batter. Thinner starters will make a wetter dough.I like to weigh my starter, as it is extremely sticky to put it in a measuring cup and then try to scrape out. You also get a much more accurate amount, since the bubbles will drastically effect the volume, by a factor of two or three even. Plus, there are fewer dishes to wash if you weigh everything into one bowl, rather than dicking around with various measuring cups and spoons. In order to raise bread, your starter has to be refreshed, full of bubbles and vigor. 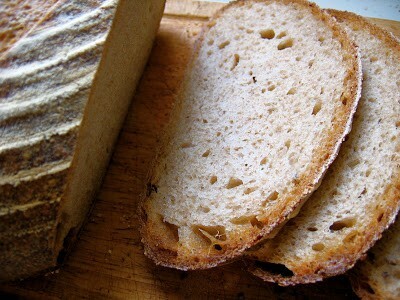 If your starter isn’t doubling within four or five hours when you feed it, it will not be strong enough to raise bread. “If baking is all about patience, sourdough baking is all about more patience.” I read that somewhere. So make sure your starter is active and full of bubbles; if it isn’t, don’t despair; bake some sourdough crackers and give the starter another feeding or two til it’s ready. I keep my starter rather thick and almost gloppy, the consistency of a very thick pancake batter. Thinner starters will make a wetter dough. I like to weigh my starter, as it is extremely sticky to put it in a measuring cup and then try to scrape out. You also get a much more accurate amount, since the bubbles will drastically effect the volume, by a factor of two or three even. Plus, there are fewer dishes to wash if you weigh everything into one bowl, rather than dicking around with various measuring cups and spoons. Stir together the ingredients in a large bowl in this order until a rough dough forms. Add more bread flour if your dough is very wet. Scrape the dough out onto a lightly floured surface (a stiff, plastic scraper, which cost about a dollar, is perfect for this), invert the empty bowl over the dough, and let it rest for 20 minutes. 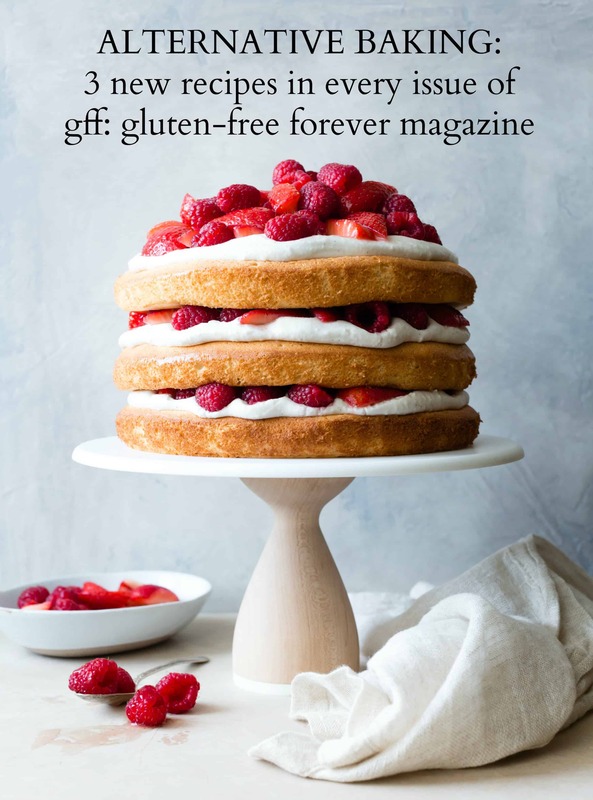 (This is called autolyse and allows the flour to absorb some of the water and the gluten strands to begin straightening out; it makes for less kneading in the end, and will prevent you from adding too much flour right off the bat.) After 20 minutes, remove the bowl and knead the dough vigorously for about 10 minutes, adding as little flour as possible to prevent the dough from sticking to your hands and the surface, until it feels smooth, springy and elastic. Gently turn the dough out onto a lightly floured surface, pressing out the air bubbles. Shape into a boule by tucking the edges under itself, then gently rotating the dough on the surface to form a taught outer layer of dough. 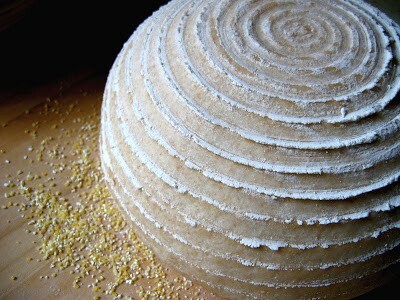 Here’s a quick video of how to shape a boule. If you have a rising basket, sift a light layer of flour onto the inside, and place the boule in it upside-down, pinching the seam shut. 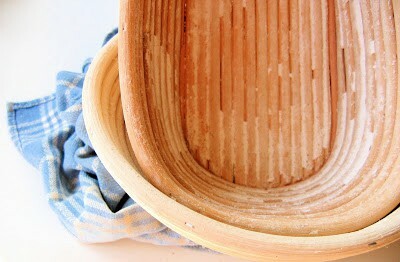 (If you don’t have a rising basket, place the boule directly on a peel or board dusted with cornmeal or flour.) Place the whole deal in a large plastic bag, such as a trash can liner. Inflate the bag and close it with a twist tie or clip. Let the bread rise a second time until doubled, about 1 1/2 – 2 hours. When the bread is ready to bake, it will hold an indentation of your finger when you press it lightly, rather than springing back. When the bread has doubled, gently turn it out onto a wooden peel dusted with flour or cornmeal. Holding a lame or sharp knife at a 45º angle to the loaf, draw the blade, about 1″ deep, across the top of the loaf, beginning and ending 2″ from the bottoms of the boule. (Just look at the darn picture, ok?) Fill a 1 cup measure with ice cubes. Quickly slip the boule off the peel and onto the stone, and toss the cubes into the hot pan on the floor of the oven. This will steam the outside of the loaf, allowing it to expand as it bakes. Bake 20 minutes, then turn the oven down to 450º and bake another 20 minutes or so, until the bread is a deep, burnished golden-brown. An instant read thermometer inserted into the middle should read 210º, the temperature at which the dough is set. Let cool completely on a wire rack, one to two hours, before enjoying. At this point, the bread is still “baking” from the residual heat and steam inside the loaf. The best way to store this type of bread is in a paper bag at room temperature for a couple days. After that, I put the whole thing, paper bag and all, into a plastic bag and continue to store at room temp. After a couple of days like that, it there’s any left over, we make croutons.